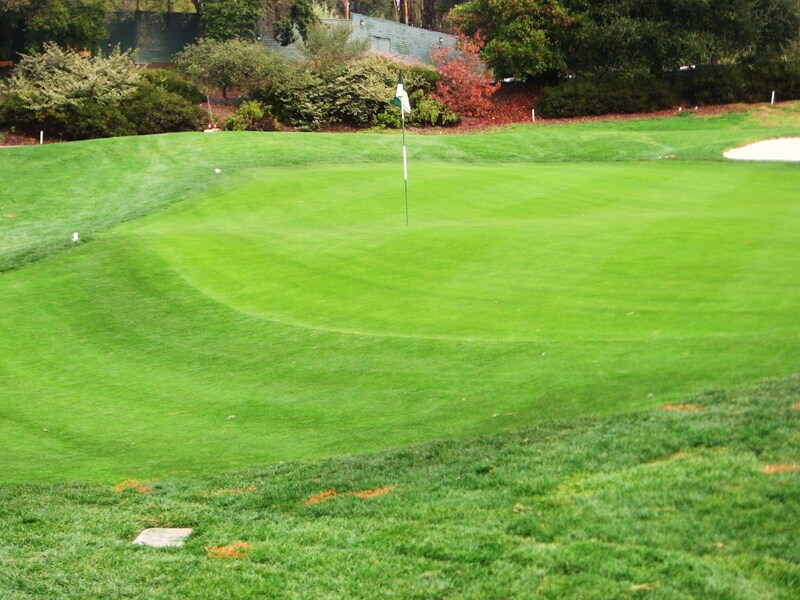 Green Fees: $220 for out of state, $125 for NCGA Members. Call pro shop to confirm. 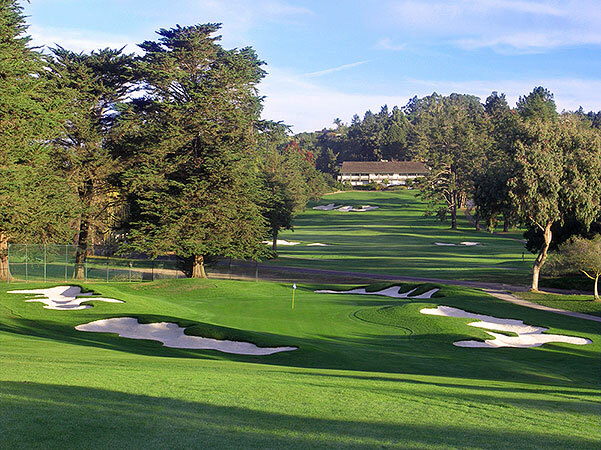 Pasatiempo was founded by U.S. Women’s Amateur Champion Marion Hollins and was designed by Alister Mackenzie, one of the great golden age golf course architects. The course opened on September 8th, 1929. Originally there were only a few homes around the course, but now Pasatiempo is at the heart of a real estate community. However the “core” course design makes Pasatiempo very walkable despite some fairly dramatic elevation changes and natural hazards. 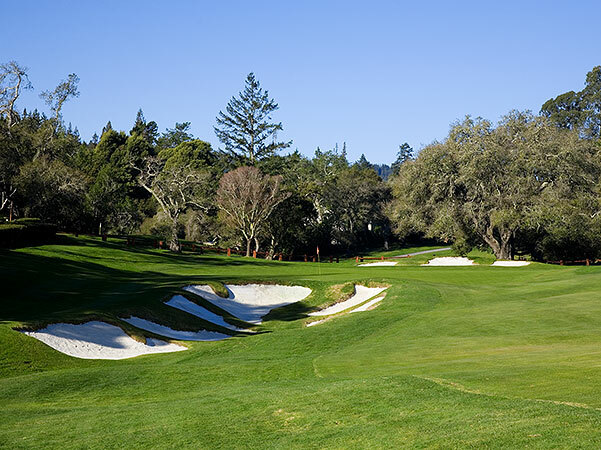 Tom Doak was hired in 1996 to begin restoring Pasatiempo to its “original design” and the renovation was successfully completed in Fall 2007, with a great deal of assistance from his lead associate Jim Urbina, club historian Bob Beck and superintendent Dean Gump. Needless to say, the course is an absolute gem from both a historical and architectural perspective, and to see it as MacKenzie had intended, even with the addition of many homes along the course, is literally awe inspiring. The 1st hole is a long opener with a downhill tee shot followed by an uphill approach. The tee sits just outside the clubhouse and is quite close to the practice green. It is a brilliantly intimate setting from which to start the round, especially on a clear day when you can see the ocean in the distance. 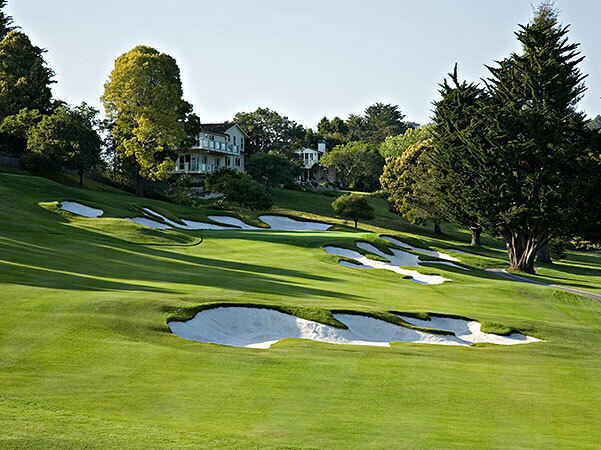 The bunkers at Pasatiempo are breathtaking and MacKenzie made great strategic use of them throughout the routing. 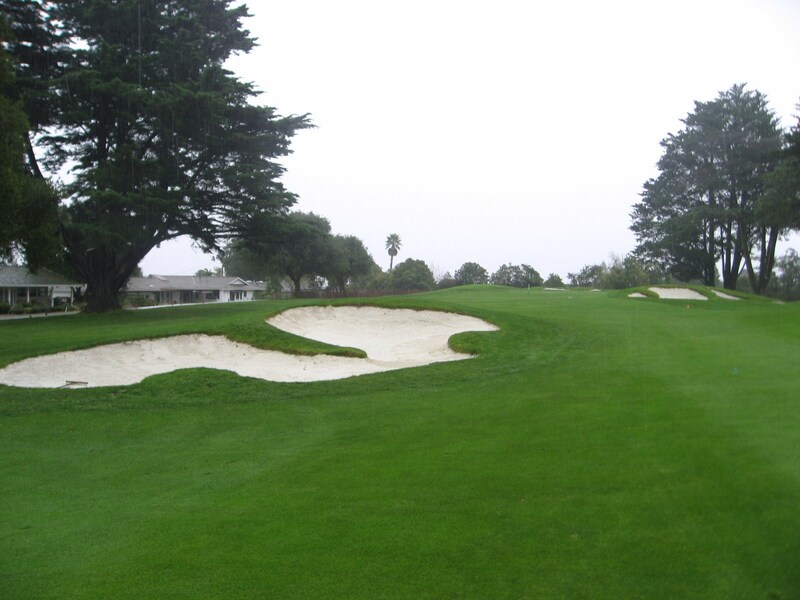 I could not help wondering, when walking off Pasatiempo, why more golf course architects were not inspired enough by MacKenzie’s bunkering to implement something similar as opposed to the shallow saucer shaped pseudo hazards that litter many modern courses. 1st Hole at Pasatiempo Golf Club. Photo by Rob Babcock – Pasatiempo Golf Club. A closer photo of the fairway bunker shows that it is about fifty yards from the green and creates more of a visual distraction than anything else. MacKenzie was a master of camouflage and visual trickery and it abounds at Pasa. Fairway bunker on 1st Hole at Pasatiempo. Photo by Rob Rigg. The 2nd is a 437 yard par four that plays down towards a wide fairway. The bunker on the front left side of the green dictates that a long fade to the right side of the fairway is ideal off the tee for the “easiest” approach. The par three 3rd presents a very challenging uphill tee shot that plays 235 yards from the tips. There is a stunning cross hazard that bisects the fairway well short of the green and a bevy of beautifully shaped bunkers surrounding the putting surface, which slopes from front to back with some wonderfully subtle undulations that make putting both difficult and a lot of fun. View from the Third tee at Pasatiempo. 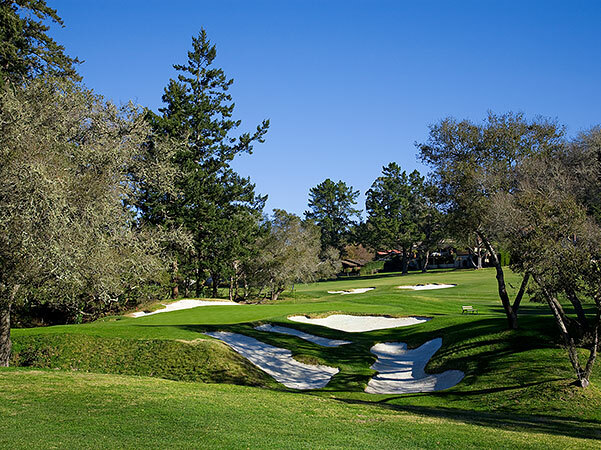 Photo by Rob Babcock – Pasatiempo Golf Club. The 4th is a medium length two shotter that pays to the southern tip of the property. The drive is a fun one as it carries two large fairway bunkers on the right side before leaving an approach to a well bunkered and undulating green. The 5th starts the uphill trek back towards the clubhouse. At 190 yards it is not quite as daunting as the 3rd but still provides a great deal of challenge for the golfer as he tries to fly his ball onto the green while avoiding four bunkers protecting the front. The 6th and 7th are probably the least interesting holes on the front side. The par five 6th is reachable in two if you can avoid the homes very tight on the left side while playing uphill over a rolling fairway to a green with a large bank on the right side. The 7th is a 348 yard two shotter that plays uphill to a well protected green with some of the deepest bunkers on the course. In contrast to the long and challenging uphill 3rd, the 8th is a downhill one shotter from 175 yards. As the photo below illustrates, the front to back sloping green has three rear sections that funnel to the middle and then rather steeply off the front. The 9th and Clubhouse feature prominently in the background on what is a reachable but challenging uphill par five with three very deep bunkers fronting the putting surface. Eight and Nine provide a great finish to an interesting and challenging front side. 8th Hole at Pasatiempo with the 9th in the background. Photo by Rob Babcock – Pasatiempo Golf Club. While the front plays south away from the clubhouse and then north back to the clubhouse, the back nine plays in an area to the northwest that has some wonderful barancas and undulations. The 10th begins with a wonderful tee shot across a baranca, which is followed by a mid iron approach to a wide green with a frightening array of bunkers waiting front left to gobble up anything hit short. Approach to 10th Green at Pasatiempo. Photo by Rob Babcock – Pasatiempo Golf Club. The long par four 10th is followed by an absolutely wonderful two shotter in the 11th that plays uphill with a baranca running up the left side off the tee which must be crossed on the approach to a well bunkered green. The view from the green on a clear day is all world. The 12th is a shorter par four that plays downhill back along the 11th, with the baranca again on the left and cutting even tighter across the front of the green. The three par fours are followed by the par five 13th which doglegs to the left from tee to green. There are some well placed hazards on the left side of the fairway to gobble up any drives that try to cut the corner too much. The undulating fairway makes for some interesting lies and the approach is to a green set amongst a sea of sand which quickly raises the golfer’s heart rate. As seen in the photo below, the Y shaped green slopes towards the middle and then down a fairly steep false front to the fairway. Anything off line will lead to a challenging up and down as the bunkers are set back from the green unlike most other holes where they are tighter to the putting surface. Approach to the 13th Green at Pasatiempo. 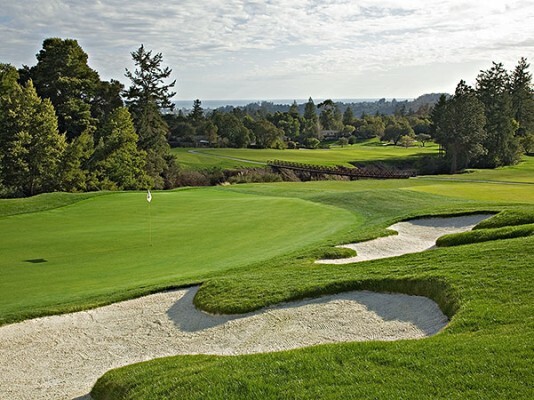 Photo by Rob Babcock – Pasatiempo Golf Club. The 14th is one of my favorite par fours on a course that has many great two shotters. The hole is about 430 yards and the fairway is very wide, but severely undulating. As seen below, there is a gully that runs up the left side of the fairway that meets another gully running across the fairway about 275 yards off the tee. On many modern courses, these fairways would have been flattened to produce consistent lies which is a shame. MacKenzie has done a masterful job of using these undulations to make the hole incredibly interesting and fun to play. The green is open slightly on the front but protected by a large bunker as it moves back and to the right. A well placed drive on the left side of the fairway, but out of the gully, will leave an ideal approach up the length of the green, while a tee shot to the right will force the golfer to come in over a fore bunker and the larger greenside bunker. Top notch strategy created by a genius. 14th fairway at Pasatiempo. Photo by Rob Babcock – Pasatiempo Golf Club. The 15th, pictured below, is the first one shotter on the back side and it plays across a baranca at 140 yards from the tips. This is a fun hole with steep bunkers fronting the green and a long single bunker behind. Although the tee shot is straightforward, accuracy is paramount. 15th hole at Pasatiempo. Photo by Rob Babcock – Pasatiempo Golf Club. The 16th is one of my favorite holes on the course, another fantastic par four. The tee shot is blind to the landing area and played at an angle that encourages the golfer to hit the ball to the right side of the fairway. When you reach the top of the rise and look towards the green you will be awed by a daunting approach, that will probably be downhill or sidehill, over the biggest bunker on the course, which lurks below an elevated green that slopes steeply from back to front. And, to make the challenge even more difficult, you have to hit back over a gully that runs across the hole short of the green. Approach to the 16th at Pasatiempo. 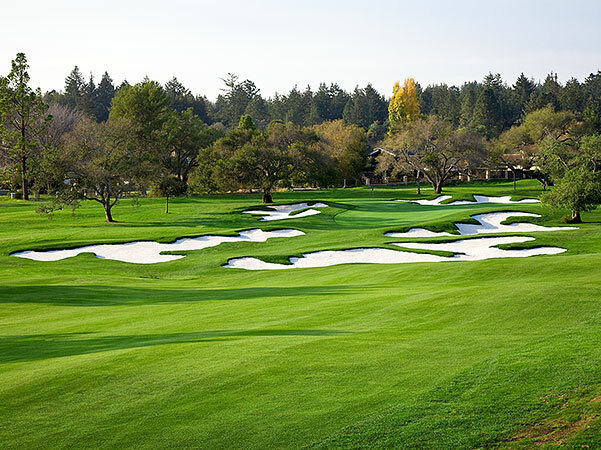 Photo by Rob Babcock – Pasatiempo Golf Club. The 17th is an uphill two shotter that plays to a bunkerless green that features a sharp drop off if you miss to the right. The penultimate hole is the weakest on the exceptional back nine and provides a breather before taking on the gorgeous par three 18th. The round finishes with a tee shot of 170 yards across a gapping chasm to a wonderfully undulating green protected by bunkers front left and across the back. 18th tee shot at Pasatiempo. Photo by Rob Babcock – Pasatiempo Golf Club. As seen in the photo below, the 18th green has a lot of great movement and short grass on the front right that creates a difficult up and down for the golfer who misses short but avoids the bunkers and the baranca. A par on the final hole is well earned and a great way to finish a round on what must be one of the best inland courses in the country. 18th Green at Pasatiempo. Photo by Rob Rigg. 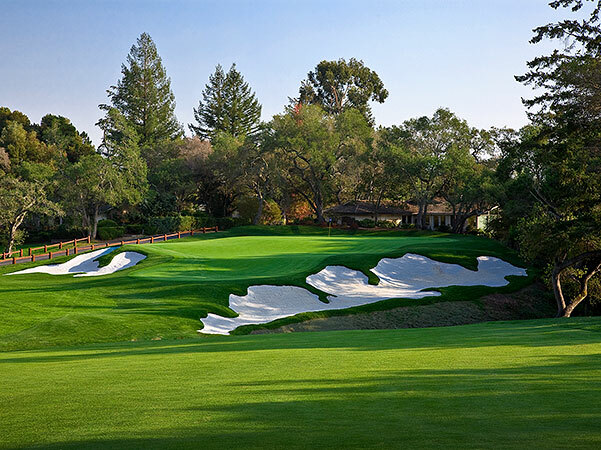 While Pasatiempo has been routed over undulating terrain, the short green to tee walks and 6,600 yard distance from the tips make it a very manageable walk which is why it has been rated 3.0 out of 4 for walkability. This rating coincides with what walking walking golfers have submitted to our Walkability Ratings initiative. The Architecture and Aesthetics are world class, 4.0 out of 4, especially considering Pasa is an inland course surrounded by housing. I have never walked a course where the great architecture has so heavily outweighed the residences that line the fairways on many of the holes. Every golfer should visit Pasa if they are in the area to experience MacKenzie’s masterpiece, it is certainly worth the rather heavy price of admission. MacKenzie’s 13 General Principles of Golf Course Architecture include call outs for providing the scratch golfer with constant stimulation while also allowing higher handicappers to enjoy the round even if they pile up high scores. 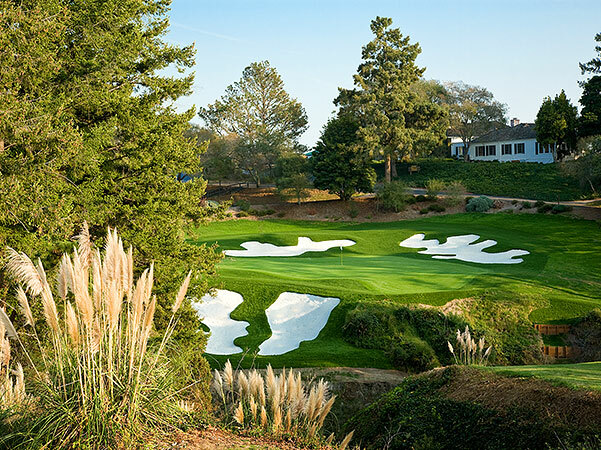 This is where Pasatiempo shines and it certainly receives a 2.0 out of 2 for Strategy and Playability. The fairways at Pasa are wide, there is a lot of short grass and the carries over the barancas are all fair and of reasonable distance, but still mentally challenging. This is a course that every golfer can and will enjoy. Pasatiempo is a gorgeous and challenging course that is an absolute joy to play. It certainly meets the “when I walked off eighteen, I wanted to walk right back up to the first tee” criteria that reflects greatness. After your round, the MacKenzie Bar & Grill in the clubhouse and The Tap Room on a hill above it are great places for a pint and some grub. 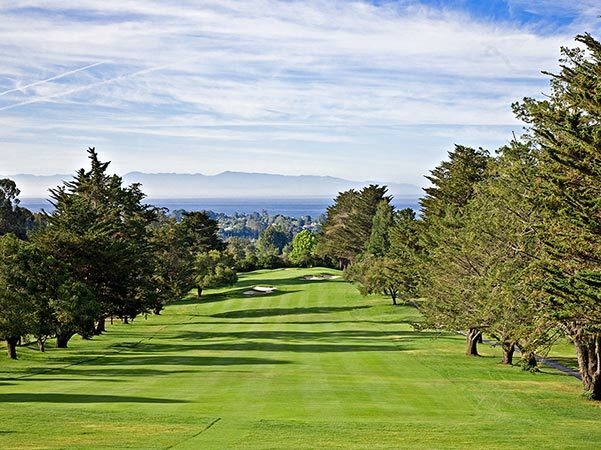 Both locations have photos of Ms. Hollins, Dr. MacKenzie, Bobby Jones and others, information on the history of Pasatiempo, along with fantastic views of the course and the ocean in the distance, at least on a clear day. My first visit to your site and this a course I’ve played 60 times or more. 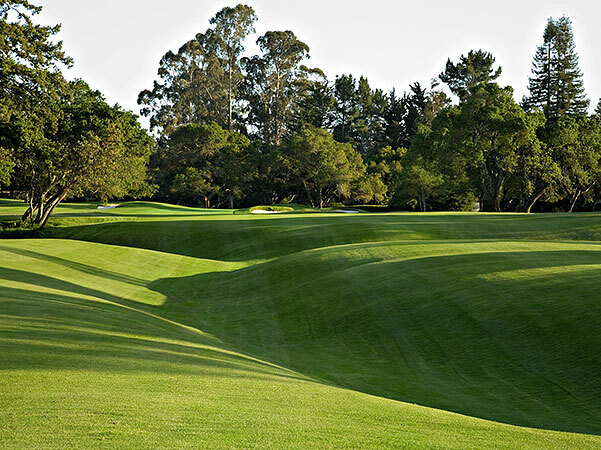 Pasatiempo, whilst a very fine golf course is a rather challenging walk, holes six and thirteen are dull fives at best, seven cannot be played as intended due to modern legal considerations and is thus rendered rather castrated. The bunkers as restored prove why they evolved as they did as they were unmaintainable no matter how artistic they may appear. 3/4 walkability is generous, you’re assuming that everyone is young and healthy and has not taken into account that golfers more discerning and of means are so. on a 5 point scale maybe a 3, but not a 4. I think your 4/4 aesthetics and architecture is generous for PasaT. For fairness sake one (aesthetics) has absolutely nothing to do with the other (architecture) and need to be separated for your opinions to have longevity and to not reflect your own tastes too strongly. Calling you out and keeping you honest, I’ll see you at the lounge. Your comments are much appreciated and respected – Thank you for visiting the site. The Walkability Rating of 3/4 was determined by analyzing ratings for other courses in the Green and Yellow categories. Based on WR voting for Bandon Trails and Chambers Bay by the public (avg 2.75/4) – I thought Pasa was a little easier. JMO. As feedback comes in on Pasa and others courses, yours included, I can certainly update the rating. Great point that A&A should be addressed seperately in the review, 2/2 and 2/2. Pasa is 4/4 for me, just like Pac Dunes, Bandon Trails, and others, because it is “Best in Class” IMO. There are 16k courses in the US and very few courses that I have seen, never mind inland courses, could hold a candle to the experience at Pasatiempo. The 2/2 for Architecture is pretty solid for me – the great holes and design traits minimize any weak holes in the grand scheme. The 2/2 for Aesthetics could be docked .25 for housing. I will update my review and scoring the next time I get down to play Pasa – I hope it is soon. My daughter, Elizabeth, who is captain of the Oakland University golf team and I stopped into Pasatiempo in December 2009 with the intention of booking a tee time for our foursome later in the week. It was a rainy weekend day and we were the only two people in the shop. Unfortunately, the staff greeted us with an attitude of such condesending arrogance that Elizabeth vowed to never set foot on the propoerty again. Amongst other things they quoted us $325.00 green fees, which we would have paid if they had treated us decent. We toughed it out without them and played Spanish Bay, the Pacific Grove Municipal and Cypress Point that trip. I played Pasatiempo 100 times in the late 1950’s when they offered a junior card for $5 a month! You could play all the rounds you wanted to play after 3:00 PM. I literally lived on the course for those two summers, and everyone was very open and cordial. Looking at the pictures in this article shows how much they have ‘restored’ the course. The lay of the greens and bunkering is very much altered, and it appears to be all for the better. On 3 there were no bunkers that I remember to the left of the green, so I played my tee shot into the bank, whence it would roll down to the green. The back nine is a complete and enduring masterpiece, and 16 the finest hole I have ever played. I got to your website by accident, but it was serendipity to see your photos. Thanks for the time ride.